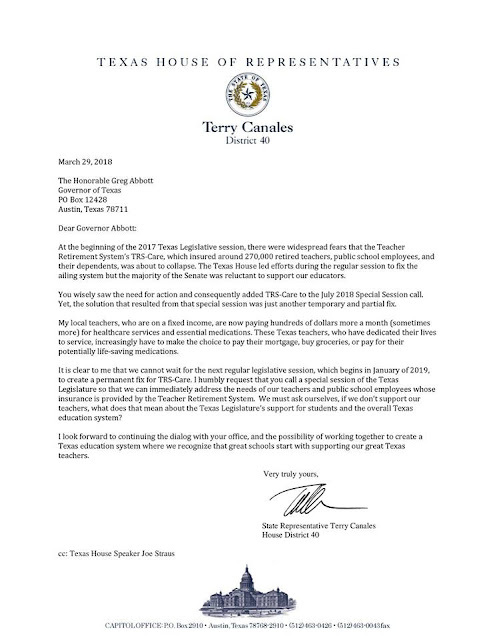 Since the healthcare nightmare--created during the 2017 Legislative Session--began impacting Texas public school teachers, custodians, secretaries, librarians, nurses, maintenance workers, classroom aides, cafeteria workers, administrators, and social workers, we have been waiting...and waiting...and waiting for a--just ONE--Texas legislator to step up to the plate to fight for us. In my blog earlier this week, I wrote about one of the countless cases that have left retirees who dedicated our lives to serving the children of this state unable to pay for the healthcare we were promised throughout our careers and when we signed our retirement papers. A book could be compiled of these cases, and it is only the end of March. Today, I received the best news I have heard since January 1. 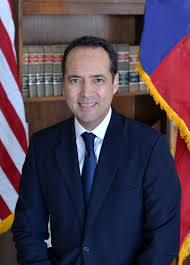 Not one but TWO Texas legislators, Rep. Terry Canales and Sen. Jose Menendez, have STEPPED UP TO THE PLATE by formally asking Gov. Greg Abbott to call a Special Session to address our healthcare! I had not realized just how much the stories from public school retirees across the state had affected me until I read Rep. Canales' letter. The tears have not yet subsided. FINALLY, two of our elected officials heard our pleas and made the decision to do something about it. I, and others, have asked how WE can help Rep. Canales and Sen. Menendez in their efforts to get Gov. Abbott to call a Special Session. Stay tuned for our CALL TO ACTION. In the meantime, I don't have the words to express my sincere, heartfelt gratitude. This is such encouraging news and I am ashamed to confess that while I am doing what I can for the cause, I have privately felt hopeless and defeated. This news you have shared is unexpected and has shown me the necessity of keeping the faith! I believe we must share this news with everyone we know and I for one am not waiting for Governor Abbott's response. I will be contacting him to thank him in advance for addressing our healthcare benefits before January 2019. You see, I am one of the retired, pre-65 educators who has been forced to stop taking life saving medications and cancel doctor appointments in order to pay my mortgage, utilities and insurance premiums for my home, car and healthcare. I have a new found hope. Thanks for sharing!! Valerie--I felt a range of emotions while reading your comment. Don't be ashamed. I think we have all felt hopeless, but uniting, fighting, and remaining vigilant and relentless have paid off! THANK GOD we have two legislators who are willing to lead the charge! Stay tuned for Rep. Canales' and Sen. Menendez's CALL TO ACTION once they know which other legislators will join them in this call for a Special Session to address TRS healthcare! I am so sorry you have had to make this choice! I hope you don't mind me sharing your post on Twitter, too! Creating a book of all of those affected, I think, is the most powerful message of all! This is encouraging. Just to know someone might care is a step in the right direction! 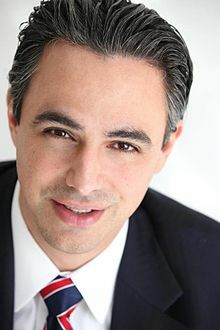 Rep. Canales sent a message that he would be sharing his letter with fellow legislators this afternoon to see who else will join him and Sen. Menendez! Hopefully there will be several more! What would this say to the thousands of university students that want to enter the teaching fields. Will they change their major/ minor and create a teacher shortage. As Mr. Canales said there are 270,000 retired teachers and each have a vote. If Abbott doesn't listen to those retired teachers those votes could go against him. It's extremely not fair that this issue hit TRS care and not ERS care. Like it was mentioned retired teachers are under a budget and can't afford paying the higher prices on medical needs. Retired teachers have not seen a cost of living increase in years. Prices go up but our salaries stay the same. The only way I can see change is by voting or changing professions to force our state leaders to make it right. Hope this special session is called before election time, or I will see you at the polls in November. Hopefully, we will see you at the polls even if there IS a Special Session. We have to continue to UNITE, SPEAK UP, and GET TO THE POLLS (and get others there, too)!!! !